A wide range of Organic and Inorganic regulatory analyses are available at Apex Laboratories, performed according to EPA, State, ASTM and Standard methods for a variety of matrices. Apex is also able to accommodate method development, bench studies and validation for special projects. 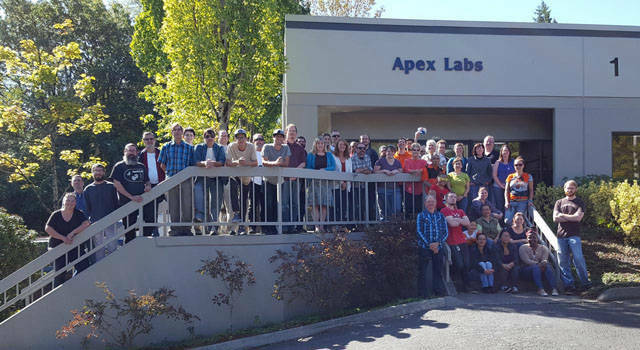 Apex Laboratories, Inc. is a privately owned, independent, full-service environmental laboratory offering unprecedented personalized service and analytical expertise. Its establishment in 2006 brought together personnel with decades of experience and a common goal to rise above the mass-production approach of large laboratory chains. Our team of over 60 professionals share the philosophy that client relationships are important to understanding project needs, and samples are not just lab I.D. numbers to our analysts but key pieces needed to solve environmental puzzles. The laboratory is designed to process samples efficiently, consistently, and effectively. Apex operates within a 17,000 sq. ft. facility with separate areas specifically designed for each analytical department and equipped with cutting-edge instrumentation and data acquisition software. Flexible spaces allow the ability to add capacity to respond to environmental spills and emergencies. Whether you need fast turn-around time for real time decisions or specialized method development and validation for unusual sample matrices, Apex Laboratories can provide. Apex serves a wide range of clientele and offers a broad spectrum of services related to environmental analysis, from providing bottle kits and courier service to helping develop a Sampling & Analysis Plan. We provide a variety of report options: analytical reports in electronic format (.pdf) or hard-copy, EPA level IV like data packages, and Electronic Data Deliverables able to interface with different types of data management systems. Apex will work with you up front to make sure that your project requirements are met and your expectations exceeded. · Annual ethics training refresher courses are provided for all staff. Apex offers a wide range of analyses by approved EPA methods for a variety of matrices. We are also able to accommodate method development and validation for special projects. Apex Laboratories uses Element Laboratory Information Management System (LIMS). Direct data uploads from the laboratory instruments to the LIMS reduces the opportunity for errors and speeds the data entry process. Capture of extensive instrument QC provides for a second level of review. Custom reporting modules allow for flexible report design. Electronic Data Deliverables are available in a variety of formats from simple Text and Excel© format to EQUIS, ESDAT, EIM packages, along with custom EDD development. Quick and convenient courier services are available throughout the greater Portland area. Services include bottle delivery as well as sample pickup, maintaining integrity of your samples throughout the transfer process.